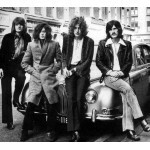 Led Zeppelin were an English rock band, active in the late 1960s and throughout the 1970s. Formed in 1968, they consisted of guitarist Jimmy Page, singer Robert Plant, bassist/keyboardist John Paul Jones, and drummer John Bonham. With their heavy, guitar-driven blues rock sound, Led Zeppelin are regularly cited as one of the progenitors of heavy metal and hard rock even though the band's individualistic style drew from many sources and transcends any single music genre. Led Zeppelin did not release songs from their albums as singles in the United Kingdom, as they preferred to establish the concept of album-orientated rock. Led Zeppelin disbanded following Bonham's death in 1980, but continue to be held in high regard for their artistic achievements, commercial success, and broad influence. The band is widely considered to be one of the most successful, innovative and influential bands in the history of music. Led Zeppelin have sold over 200 million albums worldwide according to some sources, while other sources state sales of more than 300 million records, including 111.5 million certified units in the United States, making them one of the world's best-selling music artists of all time, as well as the second-best-selling band of all time in the US. Each of their nine studio albums reached the top 10 of the Billboard album chart in the US, with six reaching the number one spot.Rolling Stone magazine has described Led Zeppelin as "the heaviest band of all time","the biggest band of the '70s"and "unquestionably one of the most enduring bands in rock history". Similarly, the Rock and Roll Hall of Fame described the band in the 1970s as being "as influential in that decade as The Beatles were in the prior one". In 2007, the surviving members of Led Zeppelin reunited (along with John Bonham's son, Jason) for the Ahmet Ertegün Tribute Concert at The O2 Arena in London. The band was honoured with the "Best Live Act" prize for their one-off reunion at MOJO Awards 2008, where they were described as the "greatest rock and roll band of all time".